Fusion, a worldwide leader in marine audio entertainment, has announced the release of two new additions to its industry-leading range of marine audio entertainment products, the Signature Series six- and eight-channel class-D marine amplifiers. Adding to the company’s existing line of monoblock, four- and five-channel Signature Series Amplifiers, the new six-channel 1500 Watt and eight-channel 2000 Watt amplifiers deliver an impressive power rating and are designed to suit all audio installation requirements. To complement the complete entertainment package, Fusion has also launched a line of high-quality performance RCA cables. The result of world-class design and engineering, the extremely powerful Signature Series Amplifiers are built with Class-D amplification for higher efficiency and output, a rigid aluminum heat sink, a subsonic filter, variable low and high pass crossover filters, and are 2 Ohm stereo stable and includes variable bass boost, behind a stainless-steel front panel with a stylish mirror finish. Ensuring low current draw from the battery while delivering increased power, the highly efficient Class-D design makes the Signature Series perfect for any boating environment. Carrying Fusion’s True-Marine accreditation, these amplifiers are protected by an industry-leading three-year warranty. Ensuring cleaner, clearer, enhanced audio signal for the best sound quality, Fusion’s new range of RCA cables and connectors feature directional, shielded twisted pair cable providing superior noise rejection. The connectors are also gold-plated to prevent corrosion. For more information on Fusion’s Signature Series Amplifiers, RCA cables or its entire line of audio products, please contact 623-580-9000 or visit www.fusionentertainment.com. Auckland, New Zealand – Vesper Marine, a leading manufacturer of innovative marine safety products, announced today that Marlborough District Council in New Zealand has implemented the Guardian:protect solution to monitor and protect its 4,200 square kilometer harbor. The solution provides live weather information to vessels on their navigation systems via AIS. Prior to this solution, weather updates were only available via VHF calls or internet connectivity to access the Marlborough Sounds weather portal. Solar 4 RVs has been recognised as an ABA100 Winner in The Australian Business Awards 2018 for Eco Innovation. The Australian Business Awards recognise high-performing organisations which implement world-class business initiatives and develop innovative products and services. The national winners will now be benchmarked against the top performers globally in the international chapter of the program at The World Business Awards. installed in an appropriate way to access maximum power harvesting. Increased environmental consciousness and maturity of the travelling market will continue the trend towards more nature based, sustainable experiences. In a survey quoted by the Australian Bureau of Statistics (ABS) 63% of grey nomads spend more than 3 months away whilst none were away from home for less than a month. The implications of using solar power for sustainable travel are therefore significant. Australian Business Awards Program Director Tara Johnston said “With technology rapidly evolving, it is essential that organisations remain ahead of the curve by continuously exploring and embracing new technologies and investing in the education, training and development of their workforce in order remain competitive. High performing organisations that have adopted an innovation culture to achieve optimal levels of productivity and performance have been recognised in this year’s ABA100”. Since launching the family business in March 2014 Solar 4 RVs has grown to supply and support hundreds of businesses and government departments across Australia, New Zealand and the South Pacific from their showroom, workshop, offices and warehouse in Rowville. They stock the largest range of flexible solar panels in Australia and have an intensive research and testing program. Winning the 2018 Australian Business Award for Eco Innovation tops an impressive list of national awards won over the years including two wins at the Optus My Business Awards (2017 Australian Retail Business of the Year and 2015 Sustainability Initiative of the Year). Entertainment Leader’s Wi-Fi Audio Streaming for Apple Devices Enables Customers to Seamlessly Send High Quality Audio from their Favourite Streaming Services to the New Apollo Series Marine Stereos. FUSION®, a worldwide leader in marine audio entertainment, announced today the addition of Apple AirPlay functionality to the new Apollo Series marine audio entertainment systems. Offering the industry’s first Apple iOS Wi-Fi streaming, the new feature is available with a free software update. The Fusion RA770 is the flagship of the new Apollo Series. The FUSION RA770 is the flagship of the new Apollo Series, epitomising creative design and technological brilliance. The world’s first purpose-built marine entertainment system with a one-piece glass touchscreen display, built-in Wi-Fi streaming, Digital Signal Processing Technology (DSP) and PartyBus capabilities, the RA770 takes marine audio entertainment to the next level. The FUSION Apollo Series also includes the SRX400, delivering a truly powerful feature set in a compact versatile form factor. Like the RA770, the SRX400 offers Apple AirPlay, Wi-Fi streaming, DSP and PartyBus functionality. Along with Apple AirPlay, Apollo users will benefit from the new Fusion-Link App update. It features a modernised user interface, over-the-air software updates, the ability to set up DSP profiles directly from the app and remote PartyBus control. Connecting to the app through Bluetooth or Wi-Fi allows the user to stream music in any zone, control volume, and access all music sources from anywhere on the boat. The Fusion-Link update is free to download through the Apple App Store® or Google Play™ and gives users the power to control their entertainment experience right from their fingertips. For more information on Apple AirPlay functionality, the FUSION Apollo RA770, SRX400, FUSION or its entire line of audio products visit www.fusionentertainment.com. When it comes to mobile living, Dometic have you covered. With products to suit a range of lifestyles from the Marine Industry to the Caravan Industry and general outdoor enthusiasts, Dometic’s mission is to make mobile living easy. Dometic helps you meet your essential needs at sea. Their complete range of hygiene and cleaning solutions, from innovative, award-winning toilets to eco-friendly and highly effective sanitation additives, will keep your boat comfortable and fresh. Whether you’re planning on getting away for a few hours, a few days or even longer, Dometic has a range of portable refrigeration options, including non-powered coolers and high-performance powered cooling boxes, to meet your needs. There is also a broad selection of accessories and spare parts to get maximum benefit from their portable refrigeration products. Dometic also offers compact, silent and extremely durable upright absorption refrigerators plus powerful and highly efficient cooling units. For the mobile cook, Dometic offers a range of solutions designed to make the most of the space available. From cooktop and sink combinations to kettles, coffee-makers and accessories, you can enjoy a delicious meal and a nice cuppa. Dometic’s innovative contribution to the Marine Industry also includes keeping you connected and in control. The revolutionary, user-friendly Dometic Smart Touch Integrated Intelligence Control (STIIC) connects your boat’s Dometic solutions allowing you to monitor all Dometic products via an app on your mobile device. For when you are in a remote location and you need power to run your appliances, Dometic offers a range of energy efficient generators/inverters plus a great selection of battery and temperature controllers, chargers and accessories to keep your products up and running. The small 100% Australian company Optitec have come a long way since their original Optitec Mover to what is their third updated version the Optitec V2+ Wireless Remote Control Jockey Wheel, helping you park everything from your caravan to your boat trailer, on offer now. 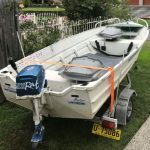 This portable, high quality device allows you to move everything from caravans and campers to horse floats, boat trailers and tradesman’s trailers with ease and precision. The Optitec V2+ Jockey Wheel has many improvements and updates on previous versions. With 30% more power, a much bigger drive shaft, a new gearbox and upgraded bearings the V2+ can move up to a maximum of 3 and a half tonne. The Optitec V2+ Wireless Remote Control Jockey Wheel was designed to be used by people of all ages. It is compact and easy to carry and install plus it will easily fit into the boot of the car, the caravan or toolbox. When development started a number of years ago, Nizpro Marine’s aim was to produce the most powerful 6 cylinder marine outboard on the market. The Nizpro Marine Supercharger Upgrade Kit for Yamaha 6 cylinder 4.2L marine outboard engines takes your engine from 300HP up to 450HP, from 5500 to 6200 rpm at 7 psi positive pressure. Nizpro Marine has put the Supercharged 450s system through significant testing to get your engine to its maximum and beyond. In terms of efficiency, the Supercharged 450s improves fuel economy at a cruising rpm. With the Supercharger system fitted, the propeller pitch is increased by approximately 4 inches which is able to reduce engine rpm at cruise speed and in turn will improve fuel efficiency. Compared to running two Yamaha 6 cylinder outboards, Nizpro Marine’s Supercharged 450s is 556 pounds lighter, no additional drag through water and no additional service costs. The complete bolt-on system comes with everything required for the installation – fuel system, injectors, reprogrammed ECU – and the whole system takes only a few hours to install. 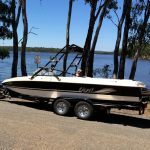 Nizpro Marine is based in Melbourne and has an in-house Dyno facility, where they can install the system onto your engine for you and run it on the Dyno, giving you a print-out with all the power information and make sure everything is running correctly. Caravan & Marine Barbecues manufacture purpose-built, high-quality stainless steel gas barbecues for creative cooking and entertaining on your boat, caravan, RV or at home and in the great Australian outdoors. Caravan & Marine Barbecues’ point of difference from other similar products is the size and the performance of the barbecue. You can use their barbecues as a cooktop or oven (with an optional cooking rack) and they are the only manufacturer of two burner marine and caravan barbecues on the market, the separate burners mean better temperature control and more controllable heat. These barbecues are really hot, putting out about 20,000 BTUs, the single burner barbecues are around about 8,000 BTUs. Ever had your barbecue blow out? The unique design, originally made for boats, makes these barbecues windproof guaranteed to 50kph, Caravan & Marine Barbecues guarantee they will not blow out. With a variety of stainless steel accessories to enhance the use of their barbecues, from mounting options to attach your barbecue to your boat, to stands and slide systems for caravanning enthusiasts to install the barbecue for ease of use, plus cooking racks, utensil tray and a purpose-built baking dish, Caravan & Marine Barbecues are perfect for the beach or the bush. Introducing Tohatsu’s NEW LPG Outboard! Robby learns about Tohatsu’s new LPG Outboard at the Sydney Boat Show. Through out the world, Tohatsu has demonstrated the reliability of it’s engines, making them one of the world’s most reputable and largest outboard manufacturers. With an outstanding team of qualified professionals, creativity and innovation Tohatsu has met and surpassed boater’s expectations.